In this course Alan Wallace presents the second installment of a line-by-line oral commentary through the remaining sections of the The Sharp Vajra of Conscious Awareness Tantra, one of the famed Dzogchen master Düdjom Lingpa’s most essential and profound visionary texts. The Sharp Vajra of Conscious Awareness Tantra provides an exposition on the entire path of Dzogchen, the Great Perfection, transmitted from Düdjom Lingpa’s pure visions into pith instruction and heart advice. Alan Wallace—authorized to share these teachings by his Dzogchen lama, the Venerable Gyatrul Rinpoche—makes this wellspring of the Great Perfection approachable to a contemporary audience, with step-by-step guidance through the theory and practice of Dzogchen. Rich discussion, practical insights, and guided meditation all support the cultivation of a deepening the practice of shamatha (calm-abiding) and vipashyana (insight), so as to open to the gateway into the utterly profound and distinctive practices within Dzogchen: in particular the practice of trekchö, or cutting through to pristine awareness. In this second of a two-part series, continue discovering the depths of the Dzogchen tradition’s approach to awakening, the pristine purity of unborn awareness, with line-by-line commentary and heart advice on Düdjom Lingpa’s famed Sharp Vajra of Conscious Awareness Tantra. These teachings are based on Alan Wallace’s eight-week retreat in Italy at the Istituto Lama Tzong Khapa in April and May 2018. Wisdom Academy has created two courses from this retreat: Restricted Dzogchen Teachings, Part 3: The Sharp Vajra of Conscious Awareness Tantra, and Part 4: The Sharp Vajra of Conscious Awareness Tantra. This course, Part 4: The Sharp Vajra of Conscious Awareness Tantra contains ten lessons will be available to qualified students in November 2018. It follows upon Part 3: The Sharp Vajra of Conscious Awareness Tantra and is not intended as a standalone course. Enrolled students will have unlimited online access to the course content and can take the course at their own pace. This course is restricted to students who have a solid foundation in the Dharma and a strong commitment to the Buddhist path. Alan Wallace has chosen to limit access to these teachings on Dzogchen due to the possibility of students misunderstanding the subject without having the appropriate background. There are two ways that students can be eligible to take this course. Students who have enrolled in Restricted Dzogchen Teachings Parts 1 & 2 are prequalified. You can log in to your Wisdom Academy account and enroll below. All others are encouraged to fill out this form to apply for Parts 3 and 4. Applications will be reviewed by Wisdom Academy and the Santa Barbara Institute for Consciousness Studies. Upon approval, Wisdom Academy will email you with next steps on how to enroll. You can enroll in just Part 3: The Sharp Vajra of Conscious Awareness Tantra, for $149, by clicking here. You can also take advantage of our special offer and enroll in both Parts 3 and 4 of the Restricted Dzogchen Teachings for $249, saving $49. Click here enroll in both courses. Please note that it is not possible to take Part 4: The Sharp Vajra of Conscious Awareness Tantra as a standalone course. In order to enroll in Part 4 separately, you must have taken Part 3. In this first lesson, Alan Wallace continues his detailed commentary on Phase 3 of The Sharp Vajra of Conscious Awareness Tantra. Alan’s commentary elucidates what Düdjom Lingpa describes in his auto-commentary as “the Faults of Benefit and Harm” and “Collapsing the False Cave and Hopes and Fears.” Ultimately we arrive at the view of all appearances as one emptiness. In addition, Alan guides us through meditations on cultivating great happiness, loving-kindness, and the stillness of awareness. In this lesson Alan Wallace brings us through the conclusion of Phase 3 of the root text, which discusses the nature of all appearances as of one emptiness in order to identify the ground dharmakaya. Alan offers commentary on Düdjom Lingpa’s discussion of personal identitylessness and phenomenal identitylessness, and leads us in guided meditation on taking the mind as the path and sadhana practice to support the unification of all the practices and teachings in Phase 3. In this lesson, Alan Wallace begins his discussion of Phase 4 of The Sharp Vajra of Conscious Awareness Tantra, offering insights and commentary on early moments in Düdjom Lingpa’s visionary account for “Determining the Characteristics and Qualities of the Ground.” Guided meditations on the space of the mind, compassion, nonmeditation, and cultivating pure view support our understanding and integration of Düdjom Lingpa’s precious teachings. In this lesson, Alan Wallace continues his discussion of Phase 4 of The Sharp Vajra of Conscious Awareness Tantra, offering insights and commentary on Düdjom Lingpa’s visionary account for “Determining the Characteristics and Qualities of the Ground.” Here Düdjom Lingpa discusses the meaning and significance of deities, the subtle body, and the variety of paths, all encompassed by the Great Perfection. In this lesson Alan Wallace guides us to completion of Phase 4 of the Sharp Vajra of Conscious Awareness Tantra and into the opening of Phase 5, “Determining Secret Dualistic Grasping and Revealing the Way of Natural Liberation.” Alan Wallace offers commentary on Düdjom Lingpa’s exquisite and pithy description of how samsara arises, from the most subtle of levels. Guided meditations on the awareness of awareness, the nature of mental afflictions, emptiness and equanimity support our understanding of these profound teachings. In this lesson, Alan Wallace brings us to the conclusion of Phase 5 of The Sharp Vajra of Conscious Awareness Tantra, and begins us commentary on Phase 6, “Teachings on the Essential Points of Practice and Their Key Distinctions.” Guided meditations on discerning wisdom, single-pointed mindfulness, and loving-kindness, as well as Sadhana practice, support our integration and understanding of this profound material. In this lesson, Alan Wallace continues his commentary on Phase 6 of The Sharp Vajra of Conscious Awareness Tantra. Here, Alan elucidates Düdjom Lingpa’s visionary instructions on distinguishing mind from pristine awareness, and ordinary consciousness from primordial consciousness. To support our study and integration of this profound material, Alan offers guided meditations on the awareness of awareness, mantra practice of Avalokitesvara, and on the practice open presence. In this lesson, Alan Wallace completes his commentary on Phase 6 of The Sharp Vajra of Conscious Awareness Tantra, and begins his commentary on selections from Phase 7: How to Follow the Path of the Great Clear Light, Direct Crossing Over. Alan discusses the relationship between prior phases and the teachings on direct crossing over and presents a general understanding on the teachings of direct crossing over; to orient us amidst the fullness of Düdjom Lingpa’s visionary path. 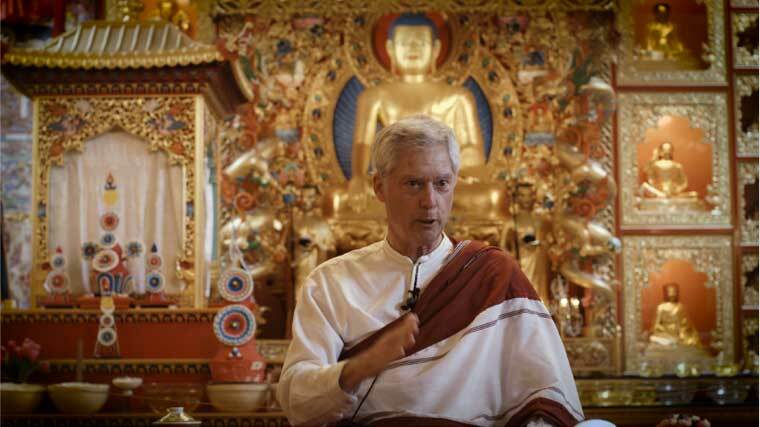 Alan also offers guided meditations on the sadhana of Avalokitesvara, on integrating practices covered thus far in the course, the four greats, and open presence. Lesson 9 will be available on Monday, January 7. Stay tuned! For our final lesson, Alan Wallace brings us to the conclusion of Pema Tashi’s commentary on The Sharp Vajra of Conscious Awareness Tantra, illuminating selections from Phase 7 and Phase 8 of the root text. Here, we come to the culmination of path, receiving Düdjom Lingpa’s visionary instructions on fruition; both in terms of the transitional stages of the bardo and the great rainbow body in Phase 7, and the spontaneous actualization of the dharmakaya in Phase 8. Alan offers guided meditations on open presence, bodhicitta, and awareness practice that encapsulates practices explored throughout the course.